Not long after Microsoft announced that its famous Xbox 360 consoles are enabled to receive HD (High Definition) media contents directly from Netflix, now Roku is also preparing its Netflix capabled media box to get ready for HD contents streaming in digital home. According to the company VP of consumer product, Tim Twerdahl, Roku users will get full access to Netflix HD library with a software update that is planned by end of this year. Roku is well known for its easy setup connecting to TV in digital home and it was also the first Netflix enabled device even before Microsoft’s Xbox. 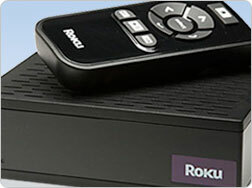 Although both seems to be getting similar contents from this world’s largest online movie renting service provider, but Roku is said to be using an advanced profiler to encode the HD movie at substantially lower bit-rates, that could possibly make the streaming smoother especially in congested broadband area. On the downside, Roku’s users may suffer a slight quality degradation compromised with better download speed. Tim further stressed that Roku users will be able to access an equivalent number of titles, or even greater than those available on Xbox 360 from Netflix websites. Although no full HD compliant with 1080P (Progressive)/I (Interlace) resolution movie will be ready now, but with 720p, it is good enough to have a great visual experience in digital home.